To celebrate the launch of Call of Duty: Black Ops 4, Activision and Treyarch created the “Black Ops House,” the worlds darkest room for players to play the game in. The Black Ops House was created in partnership with UK-based Surrey NanoSystems and their special world record-holding material called Vantablack. You might have heard of Vantablack before. It’s the world’s darkest material, absorbing 99.965% of natural light that hits it. Reflected light is trapped within the cellular structure of the coating, bouncing around inside of a series of nanotubes and never making it back out to the surface. The light is eventually diffused into heat. The properties of Vantablack mean that anything coated with it won’t have any definition that you would traditionally get from reflected light sources. See the image below for reference on how Vantablack affects a three-dimensional surface. Left: Normal black surface with light reflection showing definition. 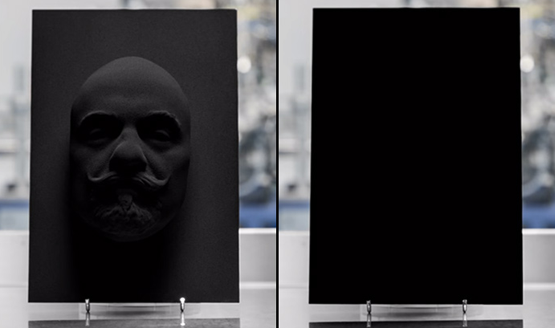 Right: Vantablack coating absorbs nearly 100% of the light, nearly eliminating definition. The inside and outside of the Black Ops House was completely coated with Vantablack VBx2. As you can see above, even in a normally lit environment, Vantablack creates a void of definition. You might then be able to imagine what effect that might have in a completely dark room coated in Vantablack, where the only source of light is the TV screen. In the short video above, Treyarch’s Jason Blundell and Surrey NanoSystems Ben Jensen talk about how the world’s darkest room is effectively a sensory deprivation chamber that allows for a complete focus on the game and the screen in front of you. Vantablack ensures that the rest of the room feels like it’s not even there. No light is reflected from its surface while inside the room, not even the TV, so players are essentially playing within an undefinable void of blackness. What better way to promote a game called Black Ops 4 with a brand new mode called Blackout, right? Unfortunately, you probably won’t have a chance to check out the world’s darkest room for yourself. The structure was erected in London, and among those privileged enough to experience it were Professional Footballer Dele Alli and a number of members of the Call of Duty community, including some prominent content creators. Call of Duty: Black Ops 4 is available now, and you can check out our review, where we lauded a game that was created specifically with the fans in mind.